It’s that time of year again! The temperatures are chilling, the leaves are falling, and the apples… are being candy coated. The recipe puts a healthy spin on a classic recipe, and incorporates our favorite ingredient… honey of course! Whip up a batch to wow trick-or-treaters, or bring along with you to the costume party on your calendar! 1. Prep the apples: Cover a baking sheet with wax or parchment paper and generously coat the paper with nonstick spray or you can brush it with oil. This is a must to prevent the apples from sticking to the paper. Remove stems from the apples and insert skewers, Popsicle sticks, or chopsticks as shown. 3. Coat the apples: Be careful with this step because the candy-coating is very hot and will hurt like the dickens if it splashes on you. Turn the heat off under the pan and allow the boiling to stop. Tip the pan slightly and dip a skewered apple in the coating. Twirl the apple for an even coat. Lift and allow the excess to drip back into the pan. 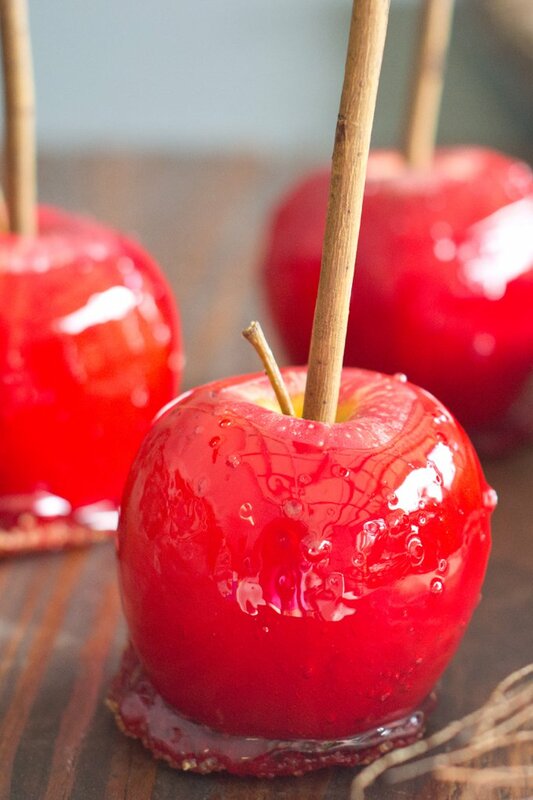 Place your newly dipped candy apple on the greased wax or parchment paper. 4. Enjoy: Enjoy the apples as is, or roll them in your favorite candy apple topping!